Domestic ducks are not migrating birds, unless you're the Fat One. 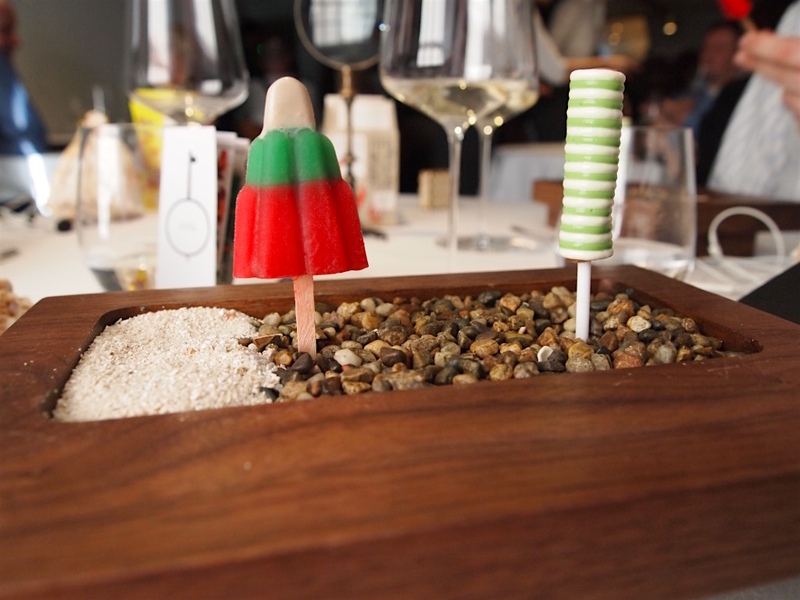 The Fat Duck has just returned from a 6-month over-summering period in Melbourne, Australia. After the last lunch service on December the 21st in 2014, the Fat Duck in Bray closed and the entire restaurant, including almost all kitchen and waiting staff, moved to their temporary, adopted home at the Crown Casino in Melbourne. During this 6-month adventure, the restaurant in Bray underwent a major £2.7 million refurbishment, including a bright and spacious state-of-the-art kitchen. 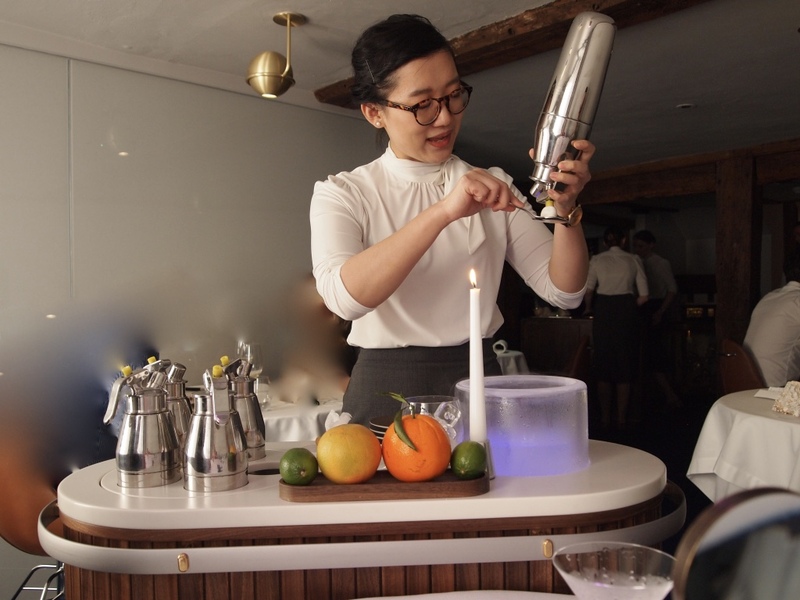 The Fat Duck flew back from Melbourne to the UK in August and its antipodean nest is now home to Dinner, which opened its doors in October 2015. 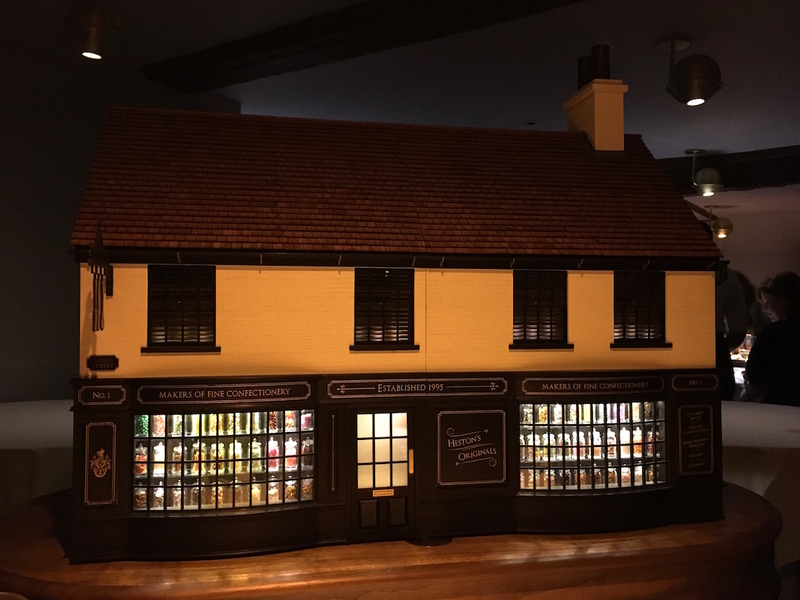 Meanwhile in Bray, the Fat Duck reopened in September with a new menu and an advance ticketing system. 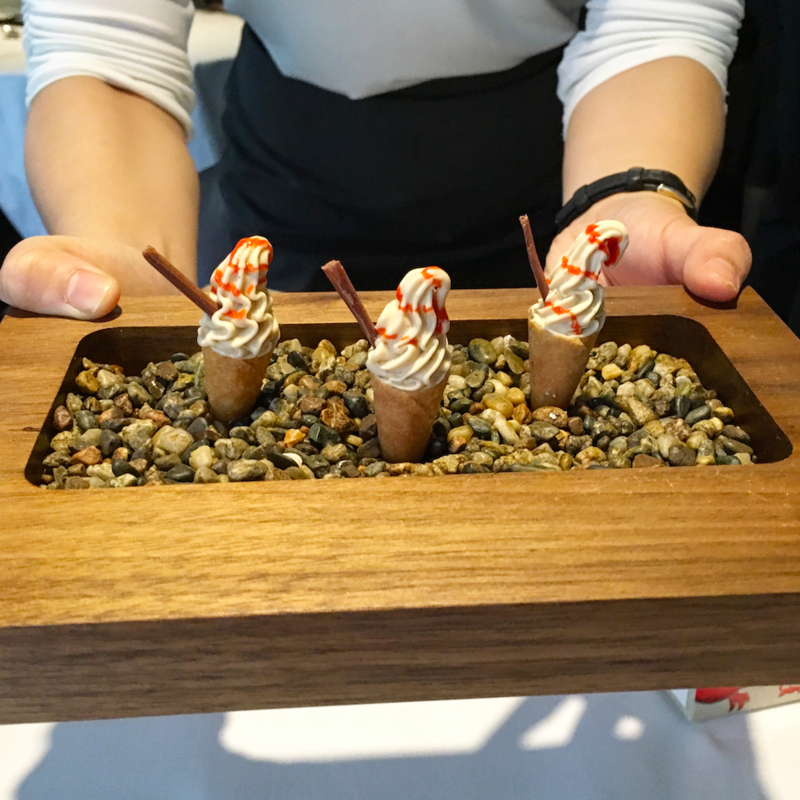 The Fat Duck is open for lunch and dinner Tuesday through Saturday. 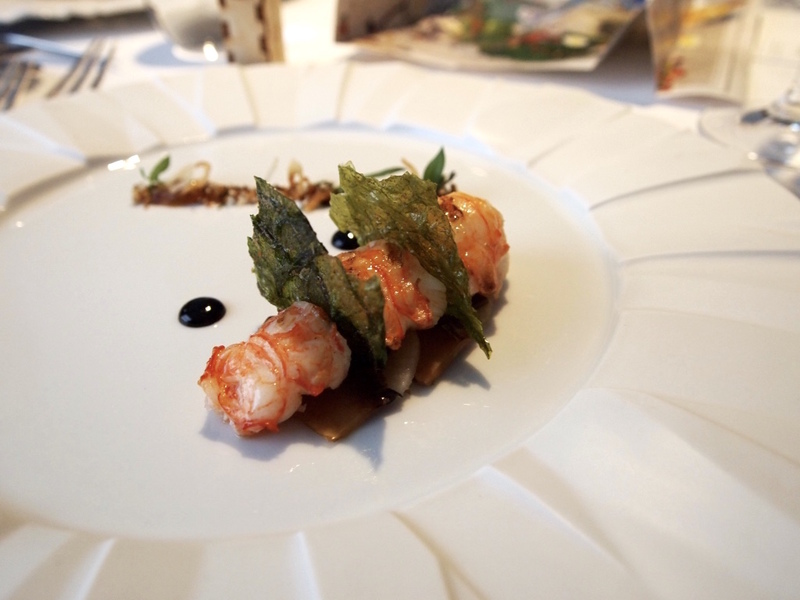 Tickets are priced at £255 (excluding 12.5% service charge), making it the most expensive restaurant in Britain, second if you count 9-seat The Araki in London, and on a par with the most expensive three-star restaurants in Paris. 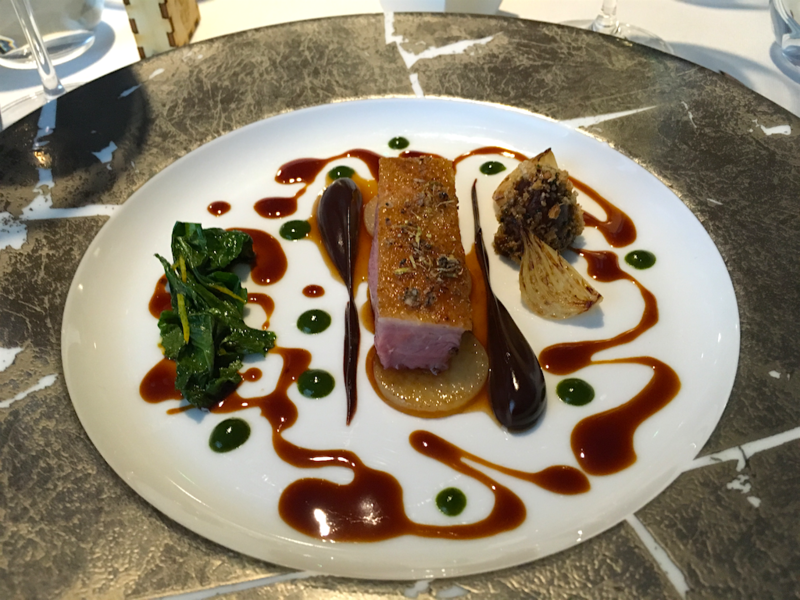 I had lunch with my husband and a friend at the Fat Duck on Thursday 20 November 2015. *I was recognised. 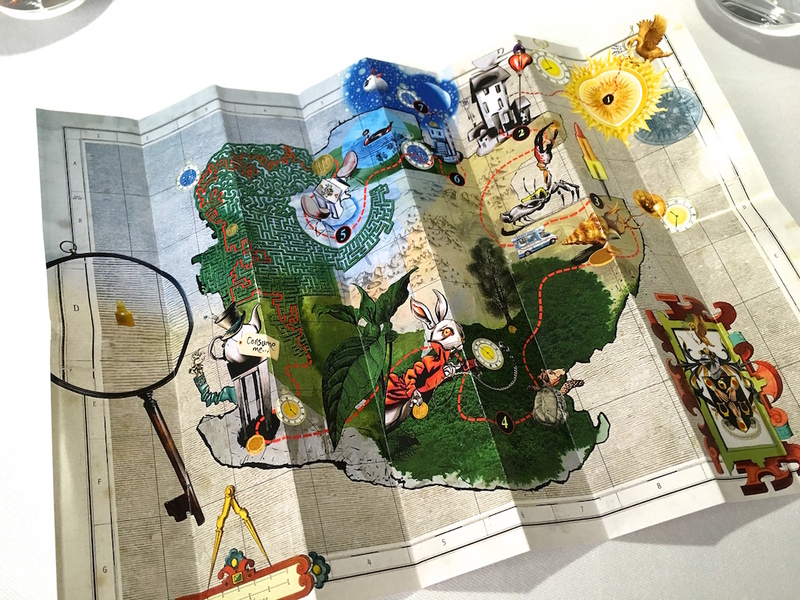 When we walked into the restaurant we arrived in a mirrored little hallway, where we were greeted by someone from the Fat Duck team who handed me a map with an itinerary on the back, explaining that this map would guide us through an afternoon of adventure, discovery and curiosity. So, off we were. After we were seated at our table, we were handed the wine list and were told that if we'd like, we could select the bottle of our choice in the wine "vault" (think thick bank vault door) on the first floor of the restaurant - which we obviously did. Next we were invited to the Fat Duck's brand spanking new kitchen. The team is very proud of their new kitchen digs, and rightfully so. Throughout the afternoon other diners were invited into the kitchen too. 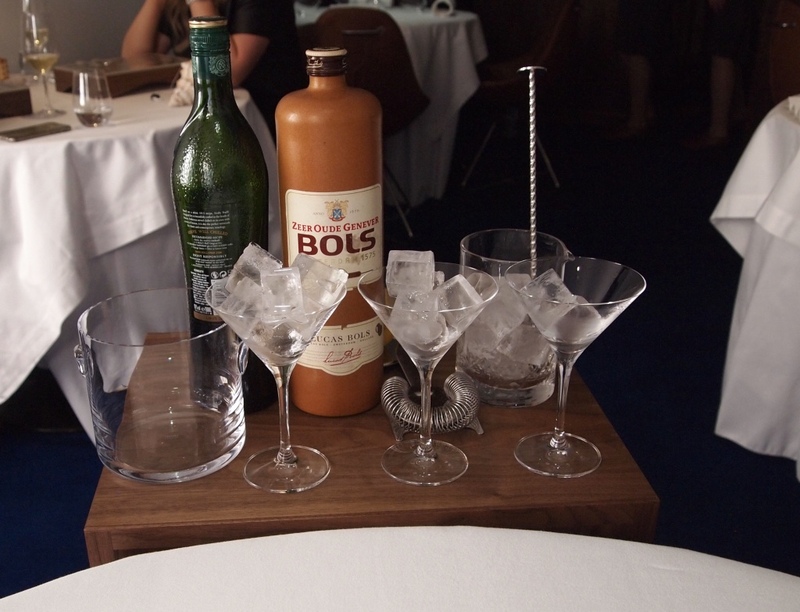 Once back at the table, we were mixed a Genever (Dutch gin) Martini, to accompany the first two courses. 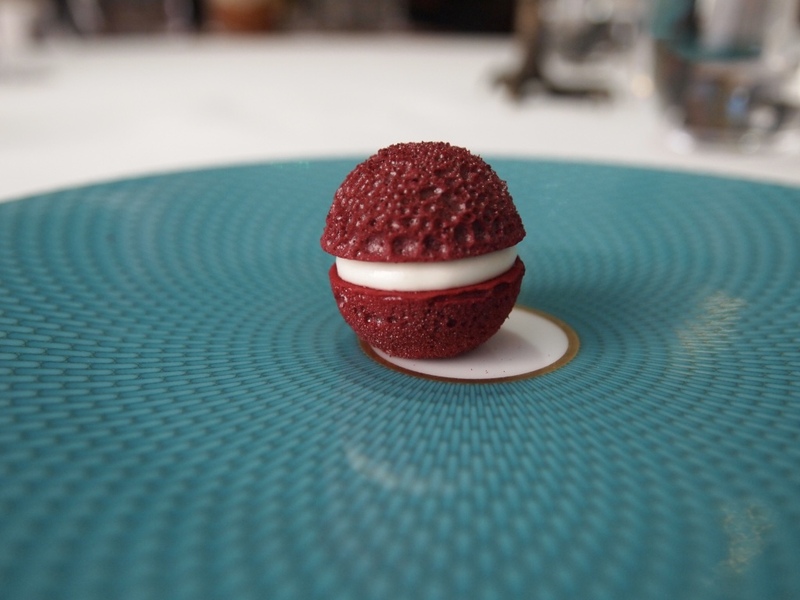 First to arrive was Change-of-air, The Fat Duck signature aerated beetroot and horseradish macaron, perfectly executed as always, its compelling flavours demanding your immediate and total attention. A couple of minutes later it was followed by Just the tonic!, creamy and smooth Jerusalem artichoke ice cream served on a smoked cumin panna cotta, garnished with Jerusalem artichoke crisps, little cubes of pickled celeriac, salsify and crunchy shallots, around which a "botanical" tonic was poured. Wonderful smoky flavours from the panna cotta, but I couldn't really taste the cumin. The tonic had a fantastic gazpacho-like freshness and was made with green tomatoes, fennnel, cucumber, green apples, fresh herbs, nasturtium leaves and infused with mint oil and lemon verbena among other ingredients. Next up was A Welcome drink, who will be the dragon? : nitro-poached mousse, an intricate palate cleanser that has featured on the menu since 2001, with various flavour combinations having been served over the years. On today's menu were: Paloma, Vodka & Tonic, Pina Colada and Campari & Soda. My choice was Paloma: tequila, grapefruit and basil. A blob of mousse, flavoured with these ingredients, is dipped into liquid nitrogen (-196 °C), creating an icy meringue with delicate flavours; in this case the basil was wonderfully subtle. You're supposed to eat it in one go, because this way a puff of smoke will issue from your nostrils (who will be the dragon?). A unique flavour and texture sensation. This concluded the first "chapter" of the menu called The Day Before We Go: Are we nearly there yet. The meal continued with Morning: Rise and shine, it's breakfast time. 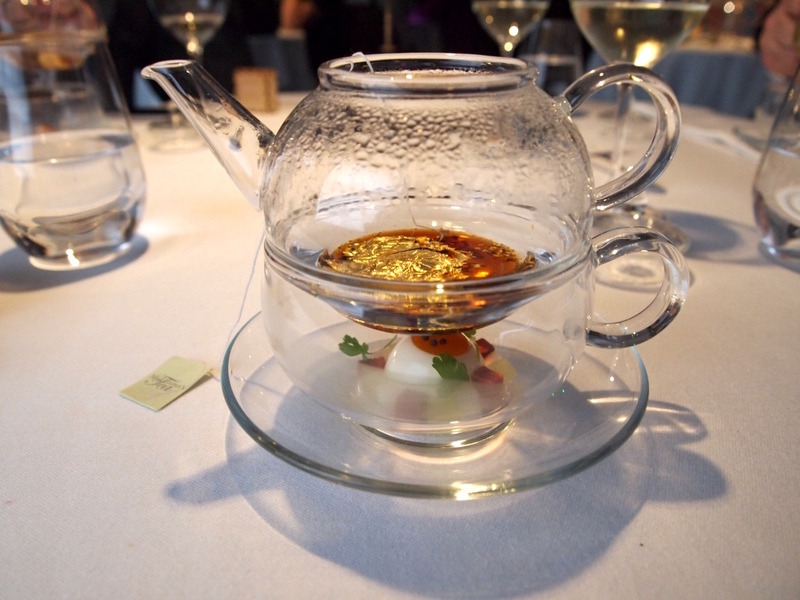 First some tea, but no English breakfast or Builder's tea at the Fat Duck; here we start with savoury rabbit tea. For this tea the "hot and iced tea" technique was used. In the glass was a concentrated warm rabbit tea with a "cold" centre. The rabbit flavours were outstandingly pure and intense, with a beautiful "roasted" finish, and the cold centre proved to deliver a creamy and round texture sensation. 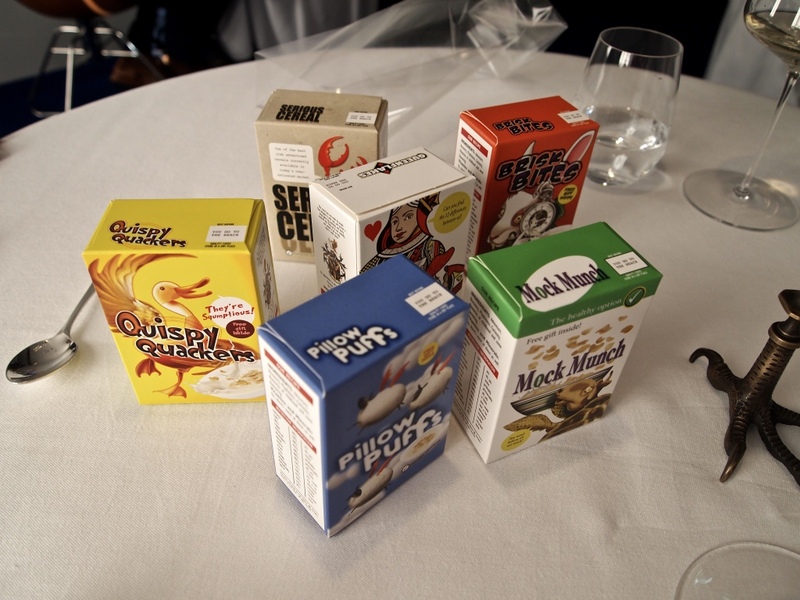 After the tea the Fat Duck's cereal variety pack was placed on the table, shortly after followed by a breakfast bowl with a truffled scrambled egg custard at the bottom, followed by layers of tomato jelly and bacon and toast cream. Inside the cereal box was a small packet of cereal and a 3-D wooden puzzle, which (once assembled) turned in to a piggy bank. 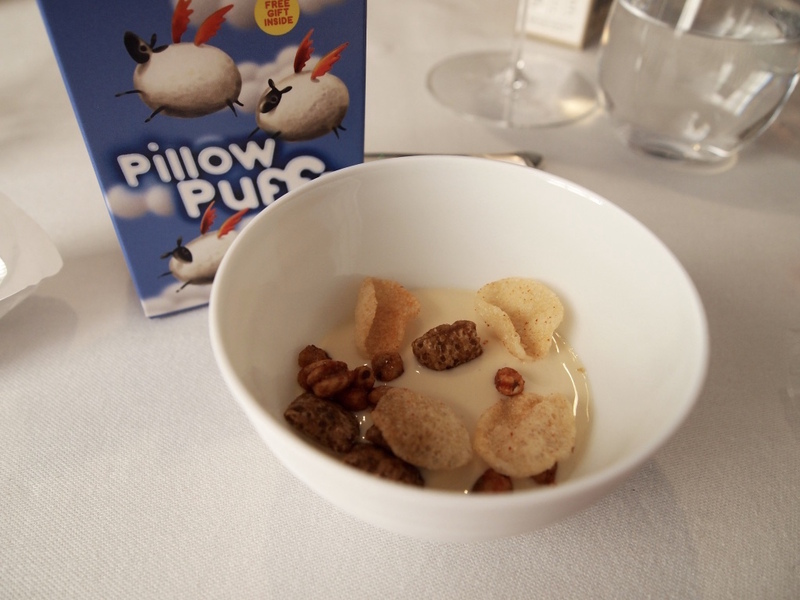 The cereal was flavoured as follows: tomato cornflakes, sausage pillows, and tomato and mushroom crispies, together with the breakfast bowl creating a "full english" flavour experience. A terrific combination that obviously intended to mess with your senses and tastebuds, but luckily not at expense of flavour. Lovely delicate but also distinct flavours in the bowl, offset by the strong and salty flavours of the cereal. The third chapter was Mid-Morning: First one to see the sea. 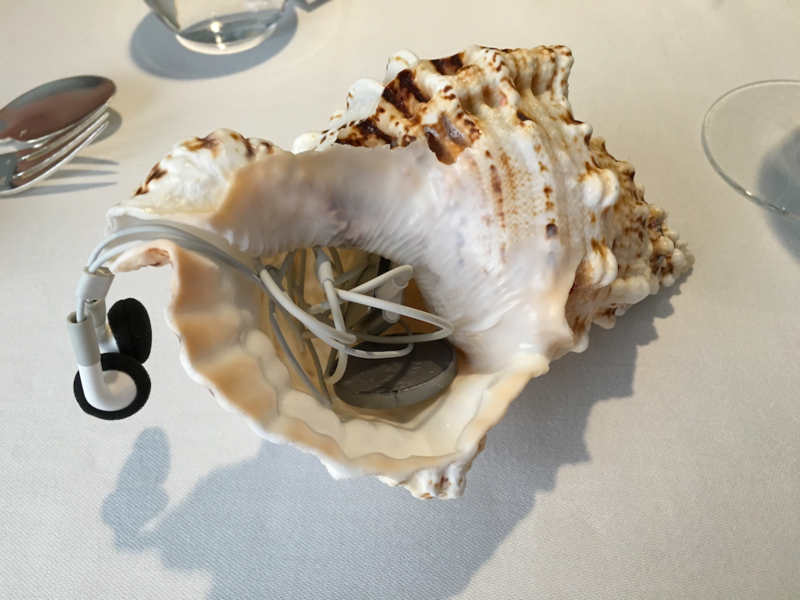 With the relaunch of the Fat Duck a number of iconic dishes such as snail porridge and salmon in liquorice have disappeared from the menu, but the original Sound of the Sea is still part of the tasting menu. 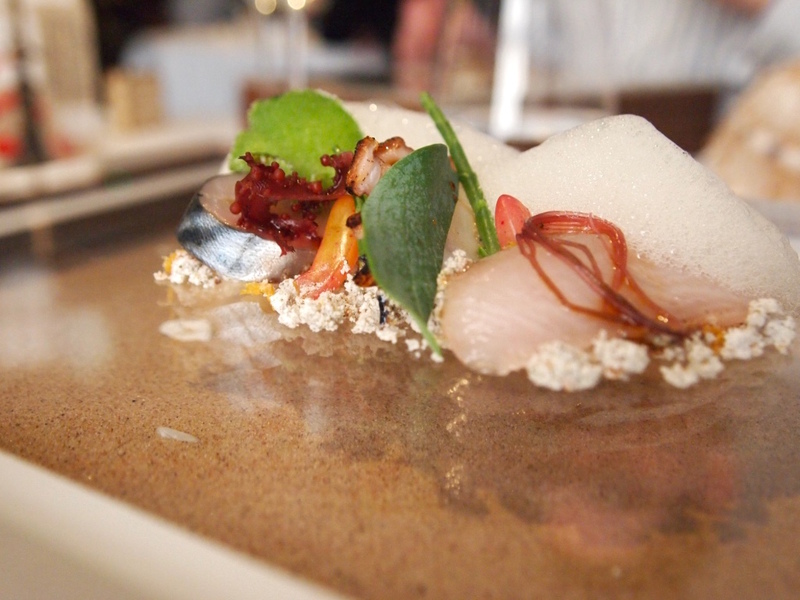 Sound of the Sea was conceived in 2007 and the dish is based on the concept that sound influences taste. Research by Oxford Professor Charles Spence has since been published (see https://thepsychologist.bps.org.uk/volume-23/edition-9/multisensory-perception-flavour), confirming that sound can have a striking impact on how people perceive food. Charles Spence's lab was used for research during the initial development of the dish. 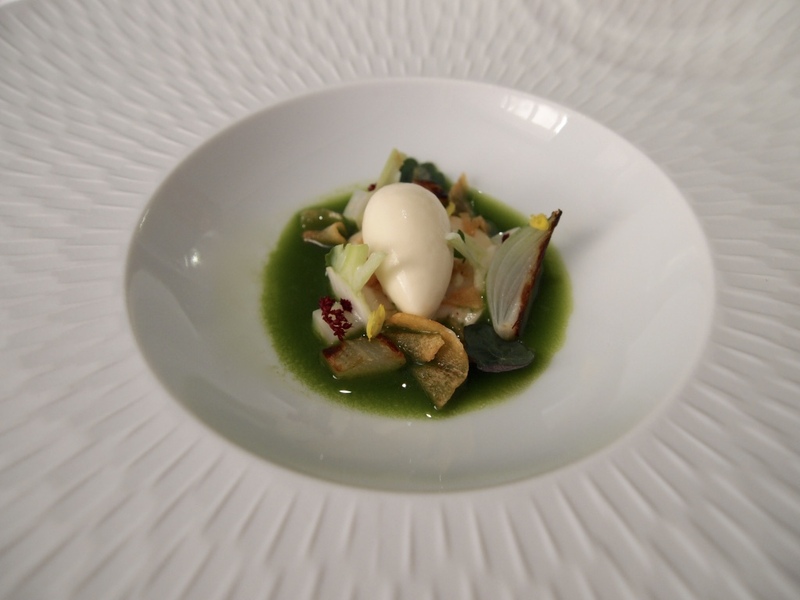 It was and still is one of the Fat Duck's most revolutionary dishes. First to arrive is a conch shell carrying a tiny iPod playing sounds of the sea, such as crashing waves and calling seagulls*. Shortly after, this is followed by a wooden box filled with sand and with a glass top, on top of which various types of fish were arranged. Today's selection were slices of steamed and then Josper-grilled octopus, lightly cured yellowtail, and some brilliantly fresh mackerel (also lightly cured). 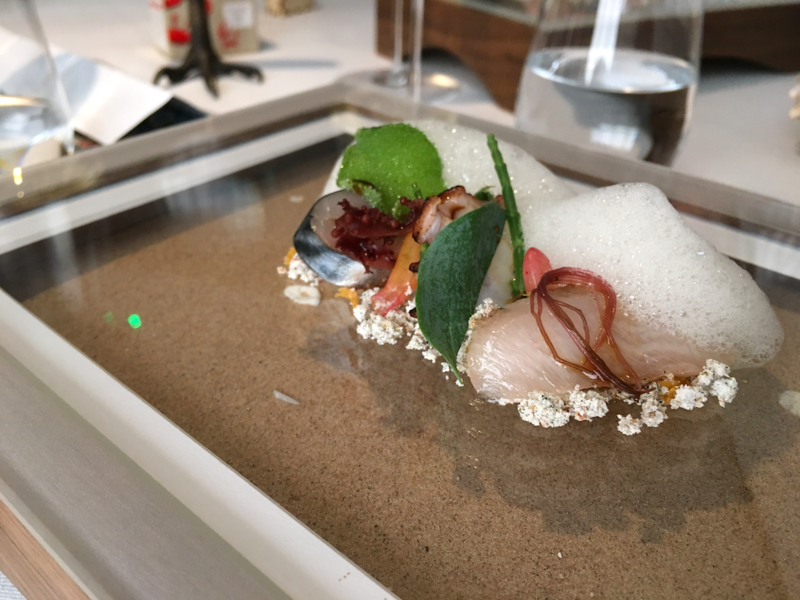 The fish was accompanied by various (pickled) seaweeds, sea vegetables such as samphire and oyster leaf, a light but distinct vegetable and seaweed foam and some tapioca "sand", lightly flavoured with miso. An exquisite multi-sensory experience; the fish, together with the seashore sound, create a true seafood profusion. Next up was Can I have some money for the ice cream van? - two precision-made savoury lollies, a Waldorf Rocket and a Salmon Twister. The Rocket had layers of walnut, celery and apple ice, a wonderful series of fresh flavours, the walnut being more intense and creamy than I remember from the last time I tasted it in 2012. Equally lovely was the Twister with spiral-shaped avocado and horseradish and a cured and tea-smoked salmon heart. Finally we were served a miniature crab and passionfruit Mr Whippy. So, we are at the sea, and tide is low: time for Then we went rockpooling. I myself am of Dutch descent, but I have been told that a British childhood is not complete without some rock pooling at the beach. This brand-new dish is based on the (shore) crabs which can often be found in rock pools. 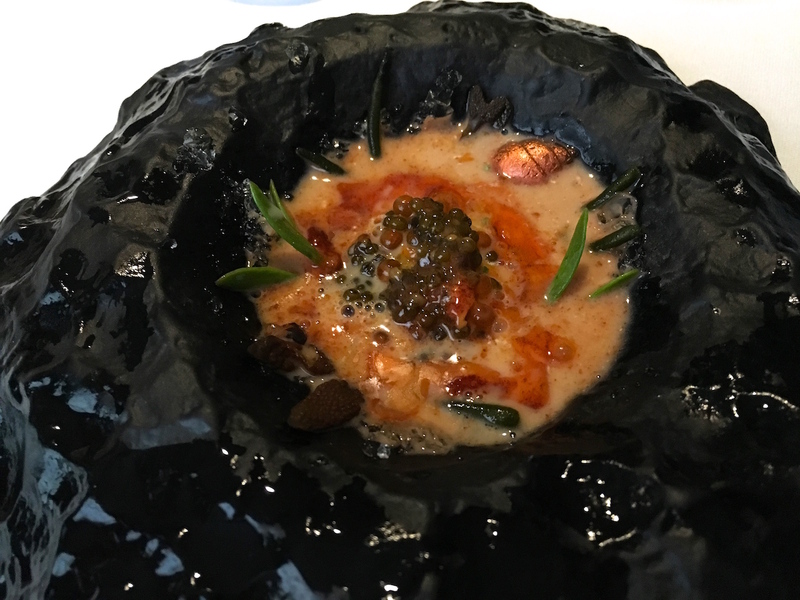 Presented on a dark, rock pool-shaped plate, is a beautiful crab shell made from a mixture of white chocolate, cocoa butter and crab oil, onto which a herb, seaweed and bacon-infused mussel velouté is poured. 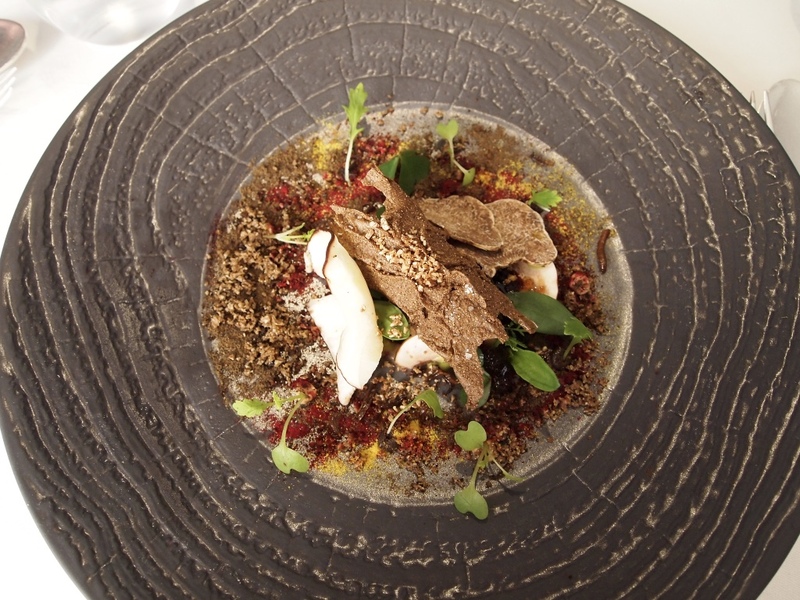 The body melts instantly, releasing its wondrous content of fresh crab meat, smoked caviar and trout roe. Also hiding in the rock pool were some sea vegetables/seaweed and some soft shells made with clam stock and sea water. A true textural indulgence with magnificent layers of flavour. There's the delicate sweetness and soft texture of the crab, there's the popping trout roe and caviar providing their all-important fresh and salty juices, and last, but by no means least, the smooth as silk velouté, which had been boosted by a touch of sweetness from the white chocolate shell and the crab oil. The first course of he Fourth chapter Afternoon: If you go down the woods today .... (and we did), was also a completely new dish. As we were Damping through the boroughgroves we came across a stunning composition of pickled beetroot - beetroot jelly - mushroom consommé jelly - cep shavings - truffle butter - cep butter - white truffle shavings - black currant jelly - lovage puree - beetroot powder - cep powder - a crunchy potato starch tree bark dusted with mushroom powder - some crisp fried "meal worms" - fresh leaves (wood sorrel, mizuna, among others). A spectacular dish with staggering aromas, textures and intricate earthy flavours, the latter being pure umami magic for the taste buds. 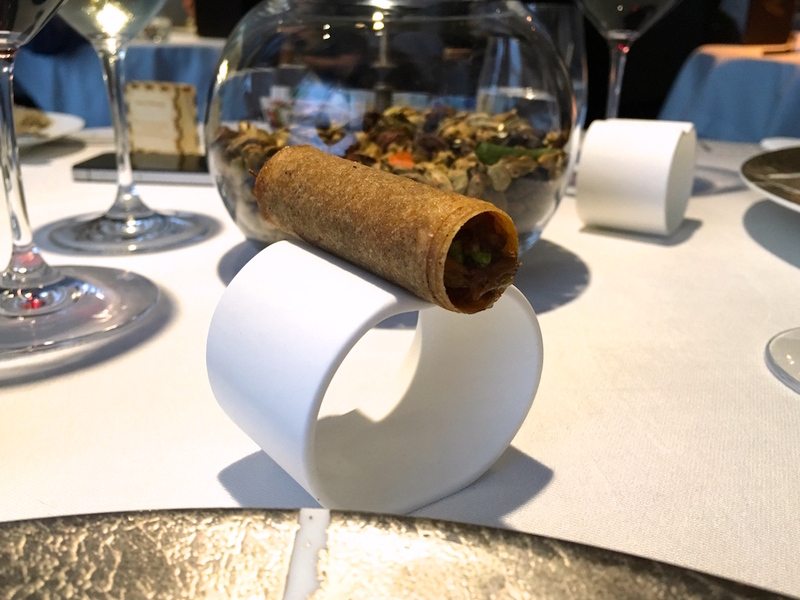 Later on .... we discovered the Mock Turtle Picnic, a quintessential Fat Duck dish. 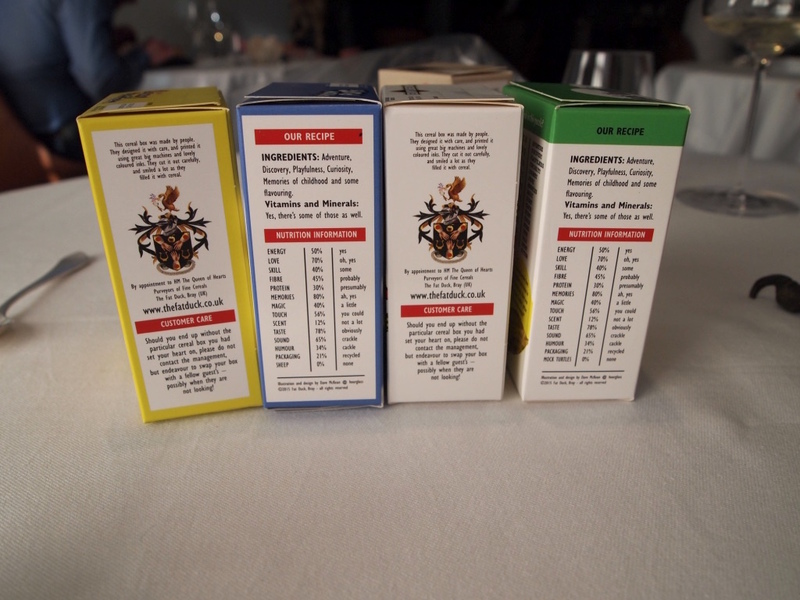 This course starts with brewing some "Mad Hatter Tea" by dissolving a gold consommé "watch" in some hot water. 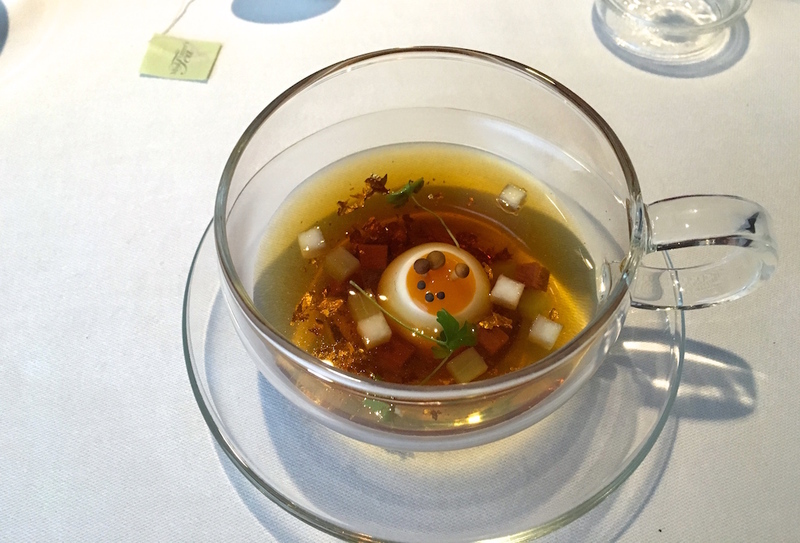 This beef and Madeira flavoured tea is then poured into a bowl with a "Mock Turtle Egg" (turnip juice white and a swede yolk), carefully garnished with enoki mushrooms. Also in the bowl are some cubes of ox tongue, pickled cucumber and pickled turnip. 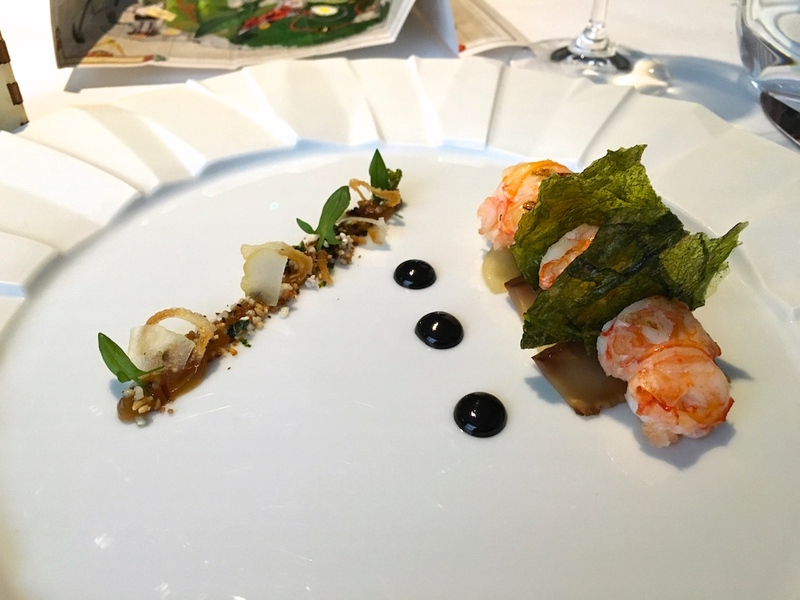 I first had this playful yet so sophisticated dish in 2012 and I'm still impressed by the high level of precision in the execution and the refinement and balance of the flavours. New this time for me, however, was the sandwich that came with it. 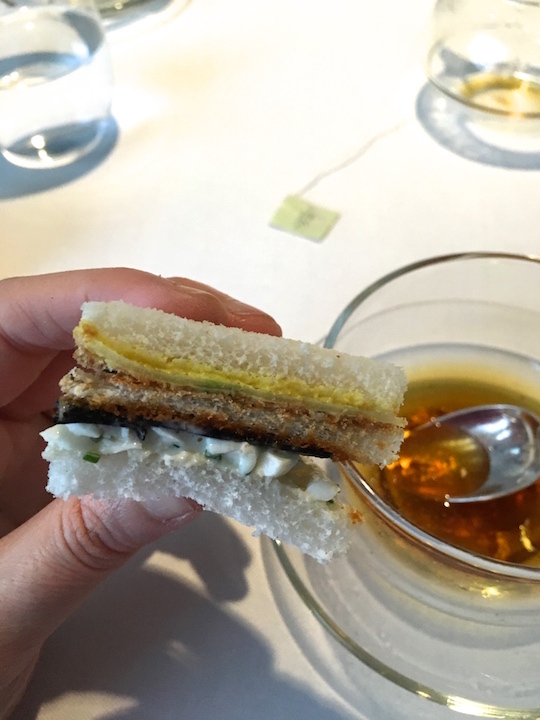 A gorgeous, precisely cut white bread sandwich with layers of thinly sliced cucumber, bone marrow and smoked anchovies, homemade ketchup, crisp toast, sliced truffle, egg mayonnaise and egg yolk mustard. A delicious filling, the toast in the middle adding texture and contrast. Time for Evening: Are you ready for dinner? Let's look at the special leather-bound menu. Ooh, there's Prawn Cocktail! The Fat Duck's prawn cocktail is actually langoustine adorned with thin sheets of chrystallised sea lettuce placed on top of slices of some braised shiitake, confit kombu and marinated daikon, and excellently paired with black sesame and plum puree and a strip of caramelised onion gel, garnished with crisp onion rings and tamari glazed sesame seeds. An elegant dish with beautifully balanced, sweet and sharp flavours. Main course: Duck a l'Orange. Crisp duck crackers (cassave-like) seasoned with warm spices arrived first. Next came the main event of exquisitely cooked pink duck breast (Aylesbury-Pekin cross) with succulent meat and a delicious skin, complemented by a sticky duck sauce, quartered roasted onions, braised and marinated turnip discs, a smooth and rich, spiced blood pudding puree, wilted turnip greens garnished with strips of orange zest, and dots of green coffee (unroasted coffee beans) and turnip top juice puree. Also served was a confit duck heart coated with panko bread crumbs and a duck "cigar" filled with tender neck meat delicately seasoned with plum sauce, pickled cucumber and spring onion. Wonderful, elegant bitters from the green coffee puree and the turnip greens, which balanced the richness of the duck and the blood pudding puree. Equally wonderful were the turnip discs, that had a terrific perfumed/spiced character to them. A superb adaption of this classic French dish with delicate and precise seasoning and fantastic aromas. Immaculate cooking on all levels. Dessert: Grapes and Cheese. 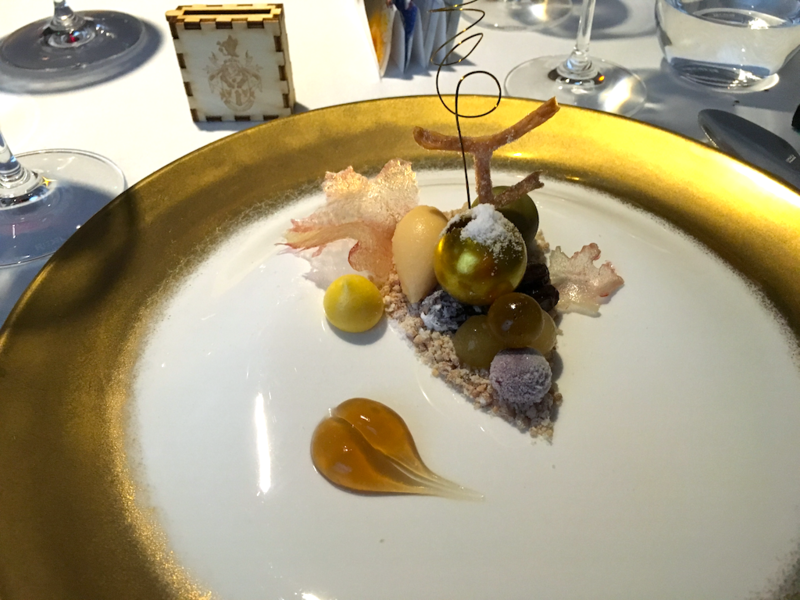 In 2012 the first version of this amazing dessert appeared on the Fat Duck's menu and was called Botrytis Cinerea, an incredibly complex dessert with multiple elements representing the (deconstructed) flavours of Chateau d'Yquem. The 2015 version uses Royal Tokaji and Brown Brothers Muscat. 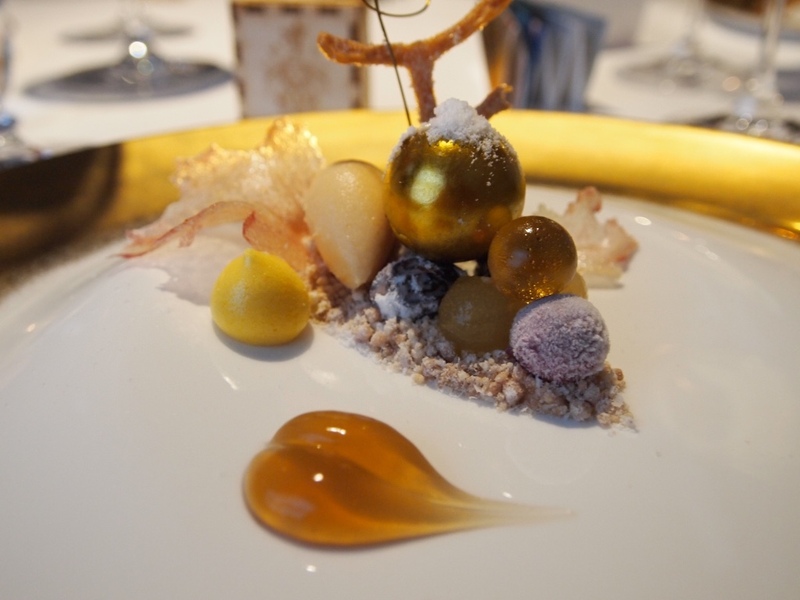 Magnificently arranged on a plate were: a sugar ball with a Neal's Yard Dairy yoghurt flavoured with citrus, a grape sorbet quenelle, a peach wine gum, a chocolate ball with a feuillantine, pear caramel and popping candy filling, sugar leaves, a compressed pear ball, a frozen grape, grape gel, soaked raisins, edible soil of crystallised chocolate, Roquefort powder and vanilla salt, and a churros stalk dusted with cinnamon and fenugreek. An unmistakable Chef d'Oeuvre displaying the highest level of technique and nailing all the characteristic grape, cheese and botrytis flavours. 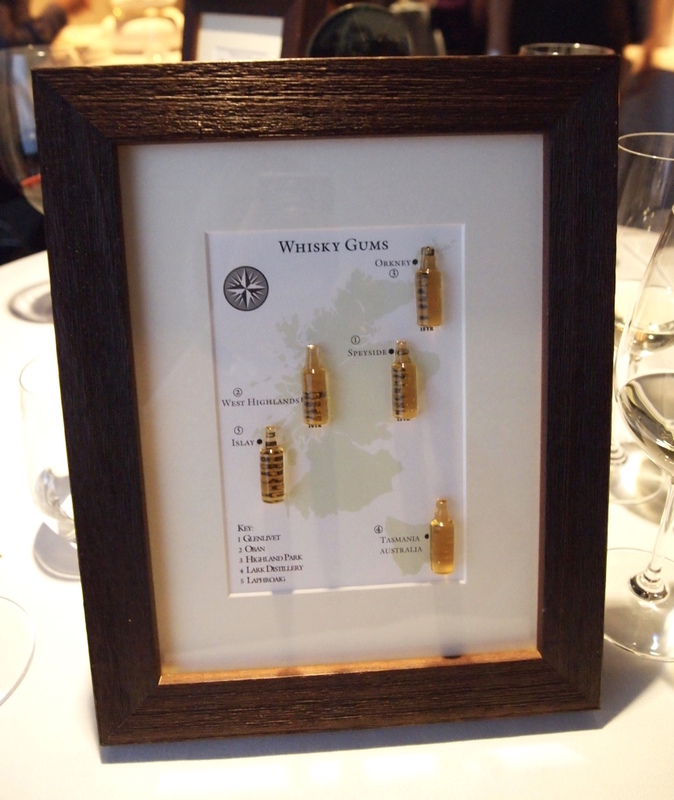 Whisky gums were served as a digestif. Right, Bedtime: Off to the land of Nod, a new dessert inspired by Johnson's Baby Powder. 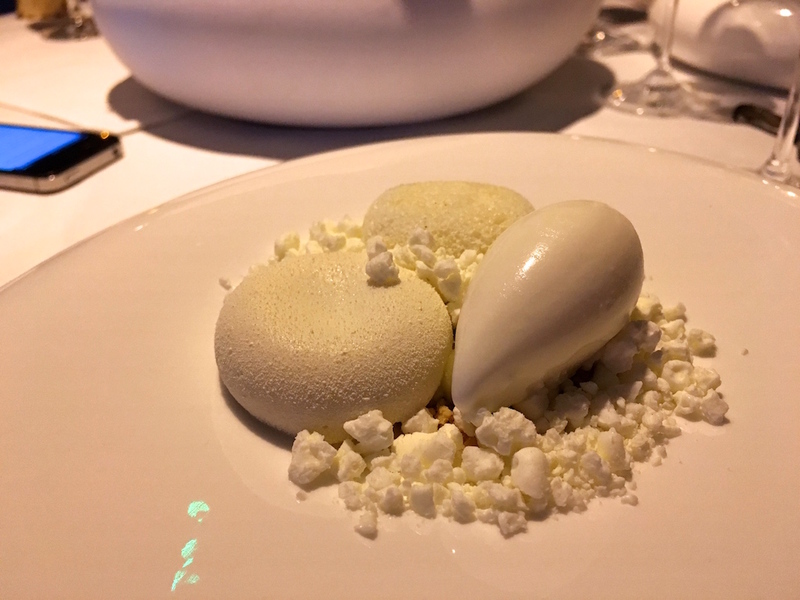 Iced "milk and cookies" meringues arrived on a magical floating pillow, shortly after followed by a complex-tasting white dessert of Earl Grey and lavender mousse, tonka bean panna cotta, a vanilla sponge, some pistachio gel, a bergamot curd, lychee yoghurt, frozen yoghurt powder. This dessert was served with a special spoon with a fluffy white handle, that had been lightly dusted with baby powder. I liked the flavours and textures in this course, but I wasn't convinced by the baby powder theme. 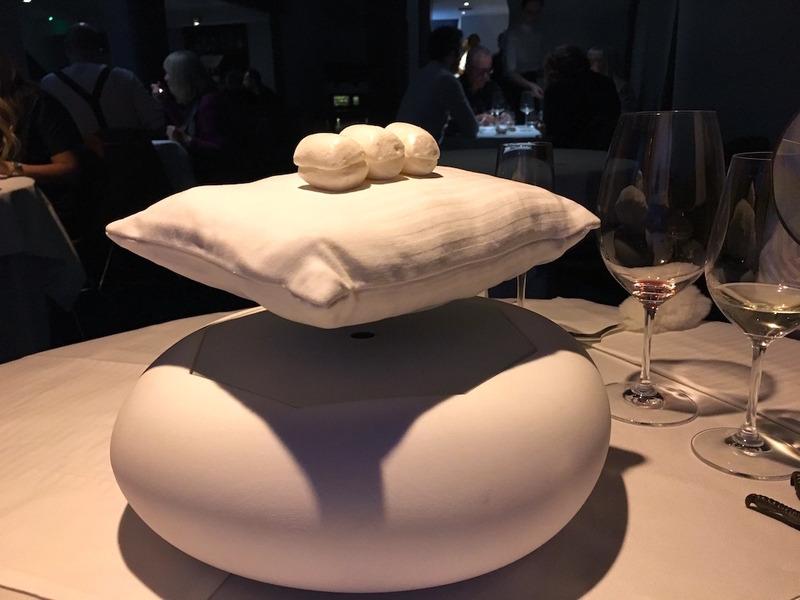 I had difficulty recognising and pinning down the individual flavours; perhaps this was because of the fabulous but also distracting floating pillow? 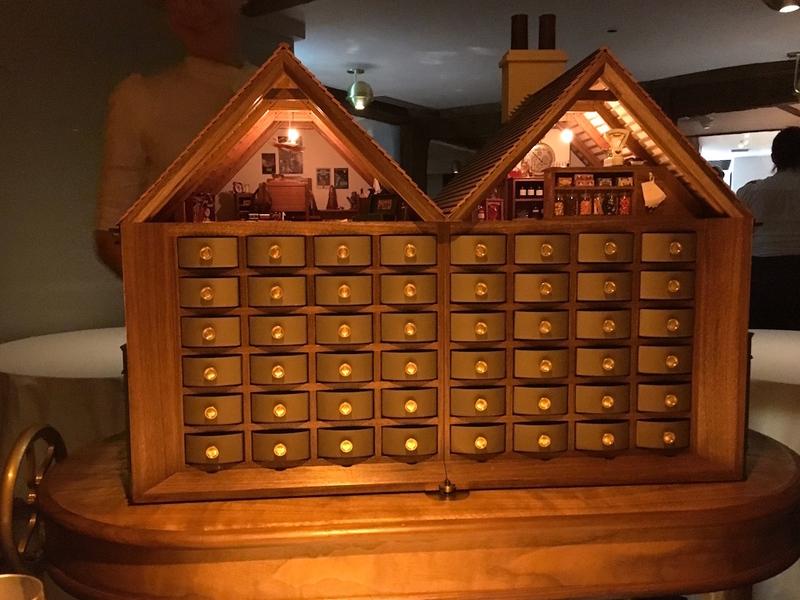 To end the meal, there was the Fat Duck's custom-built £150,000 magical sweet shop trolley, a dolls house rendition of the building which houses the restaurant (move over Celler Can Roca...), with the most beautiful and impressive opening mechanism. Equally impressive is the sweets dispenser system for which you need the coin from your piggy bank. The sweets are more or less the same as before (aerated chocolate with mandarin jelly, white chocolate Queen of Hearts with a raspberry compote filling, caramel with edible wrapper), but the coconut baccy is no longer there and new in the sweet shop is Oxchoc (nougat with shortbread, caramel and chocolate). After the return of The Fat Duck to the UK, some of its iconic dishes have remained on the menu, and some classics have been replaced by new ones. 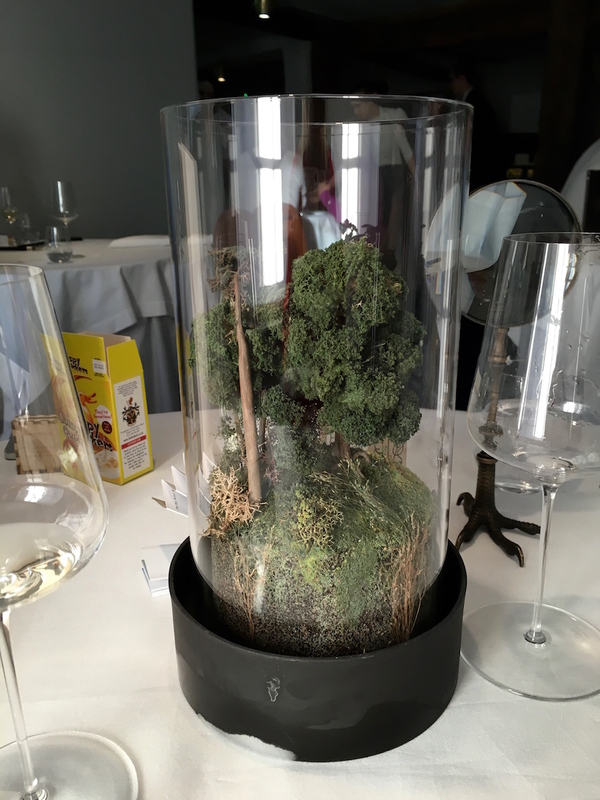 These new creations too, display an incredibly high sensory quality and the insistence upon perfection at the Fat Duck is still unrivalled. 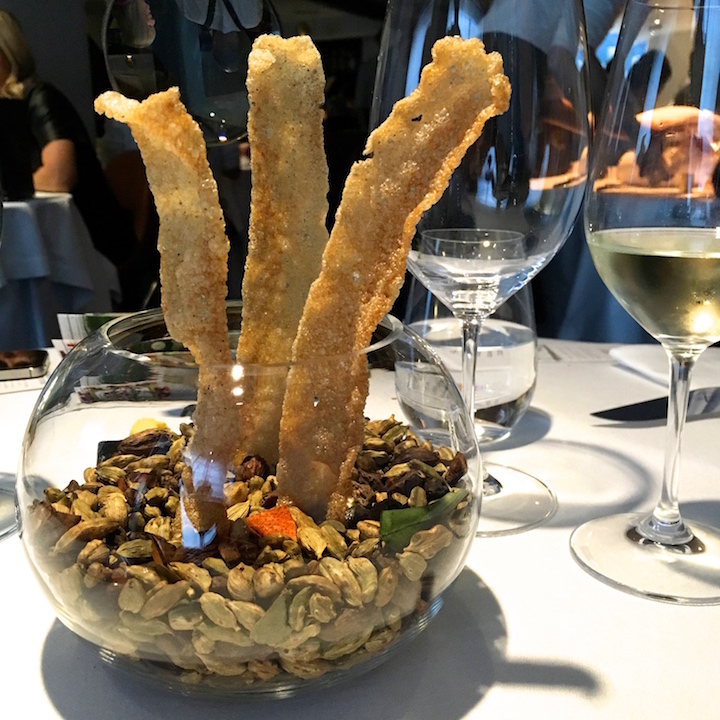 Service, these days under the watchful and experienced eye of Dimitri Bellos (previously of 2-star Marcus Wareing), was as impeccable as ever. The crab, woods and duck are all dishes of the very highest order, world-class without any doubt. However, I was less taken by the baby powder dessert - even though I couldn't possibly fault it. Was it perhaps, because the floating pillow and the (slightly impractical) spoon with its fluffy white handle, were perhaps just two props too many after an afternoon of theatre, nostalgia and adventure? All my senses were saturated at this point. The Fat Duck is the story of Heston Blumenthal and it has always told the story of Heston Blumenthal. In the past, his childhood memories were a playful undercurrent, a recurring motif that provided the menu with both individuality and cohesion. The new approach turns Heston's day of adventure at the seaside into the dominant theme of the meal, at the same time the absolute focal point and the point of origin, from which all else emanates. When you go through the front door and enter the hall of mirrors, your senses are submersed in the world of Heston Blumenthal, not only in the food, but also in the entire experience, the four-hour show. They make a special effort to involve their guests by asking them in advance for special (childhood) memories, which they then incorporate into the individual menus. Menu surprise taken to the next level. Throughout the meal they include personal touches, but I have chosen, apart from the Genever Martini, not to include them in my review, because yours will be different. 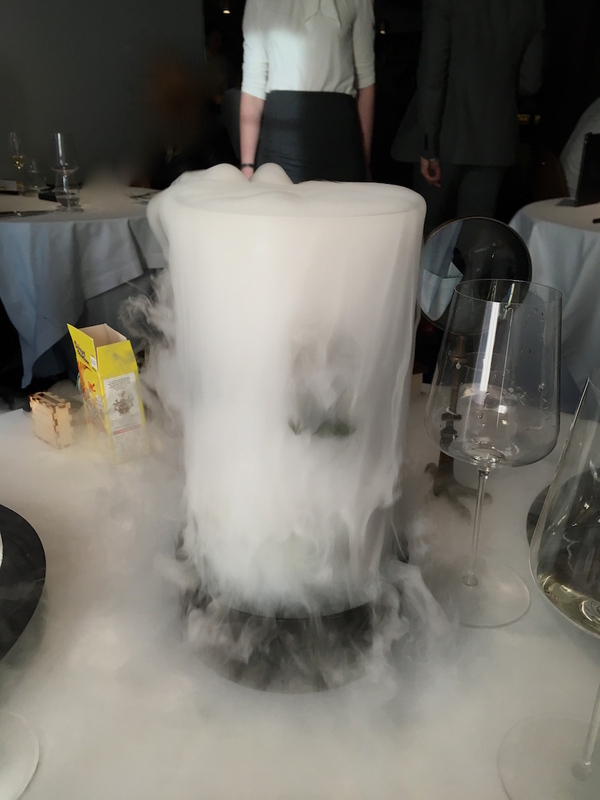 This was my fifth visit to The Fat Duck in ten years' time, and I have always found it a magical place. Today there seemed to be more wizardry than ever before. No other restaurant has ever pushed the boundaries between theatre and food like Heston & Friends are doing right now. But I do wonder, have they pushed them or have they crossed them? Each to their own, but it is certain that a visit to this restaurant will leave no one indifferent. The experience is unique, it is without precedent and it is unlikely that anything even remotely similar will ever be done again.